Lesley started with the practice during high school and helped with the	front desk. She eventually worked as an assistant in the operatory rooms. 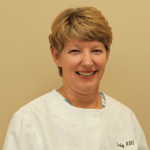 Lesley went on to attend West Liberty University in Wheeling, WV and graduated	with a Bachelor of Science in Dental Hygiene. She returned to the practice	in 1994 and works part-time.